ISO 9001:2015 changes many things, most of which make the standard more compatible with design practice. Design firms certified to ISO 9001 have until September 2018 to update their systems to this new standard if they want to maintain their certification. That’s soon! 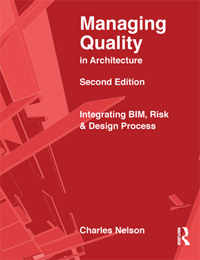 We’ve written a second edition of Managing Quality in Architecture to help design firms update their systems, and built a new website to go with it. You can order the book from any good online bookstore. Book Depository offers a good discount as well as free shipping worldwide. Go to MQIA.com to learn more. If you are seeking certification for the first time, or have a big cumbersome system that’s best junked, to start over, you should take a look at the new CHECKITx program. It comes with FREE, easy-to-use templates for both project and practice quality. There is no easier, faster, or less costly way to create a certifiable quality system in architecture.